The Import SketchUp command allows architectural drawings created in Google SketchUp® (versions 4 through 7) to be imported into Vectorworks. SketchUp component instances are imported as 3D symbols, and geometry can be designated as walls, roof faces, and floors. After importing, refine the design using Vectorworks editing tools, or replace imported 3D symbols with Vectorworks 3D symbols. Flexible import options allow either automatic conversion of architectural elements based on their orientation, or allow geometry conversion to be mapped to specific SketchUp materials or layers. Vectorworks 2011 and 2010 can import files from SketchUp 7 and earlier. 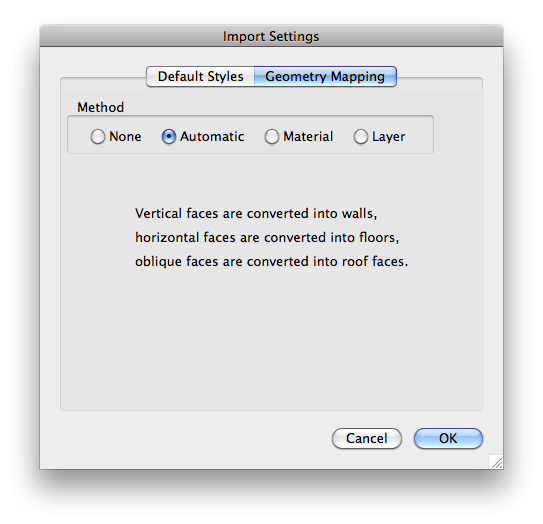 Vectorworks 2009 can import files from SketchUp version 6 and earlier. All versions of Vectorworks except Fundamentals can import Sketchup files directly from the File > Import > Import Sketchup menu. 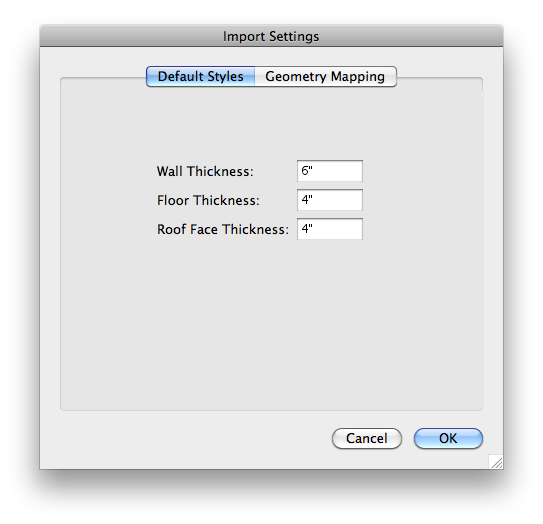 When importing a sketchup document, by default it will attempt to import the file as if it were an architectural design document, it will try to determine which objects are floors, roofs and walls. You can assign their default settings in the Default Styles tab. Most of the time you should leave the Geometry Mapping to the Automatic setting for architectural documents. If the file you are trying to import is actually just 3D geometry and not related to architecture, choose the None option under Geometry Mapping. However, SketchUp import is intended for architectural geometry. 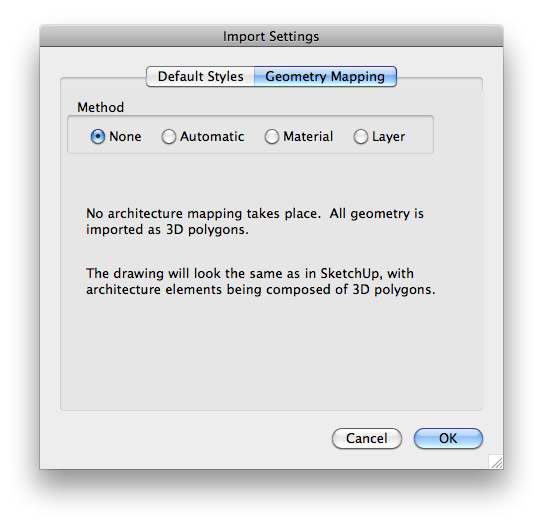 Using the Import DXF/DWG command rather than the Import SketchUp command to import polygonal geometry is recommended. After importing a Sketchup file into a new blank document, you may see nothing but a blank page. Go to Edit > Select All, then View > Zoom > Fit to Objects. This will focus on the imported Sketchup objects. If after doing these steps you end up with a blank file containing no objects, make sure you were not attempting to import a Sketchup 8 document. To import such a file, you would have to open it in Sketchup 8 and File > Save As, then choose to save it as a Sketchup 7 or earlier file before importing it into Vectorworks.